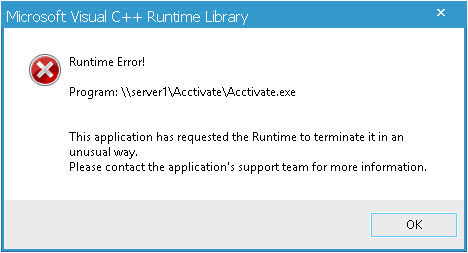 If you have received the Microsoft Visual C++ Runtime Error, this is not an Acctivate error. This error could be caused by installation of new software, and has been reported after installing recent Windows Updates. The most likely cause is due to missing or corrupt Runtime components for Visual C++ Libraries. To resolve the error you should download and install Microsoft Visual C++ Redistributable Package (x86) from ​the Microsoft download webpage. You may be required to uninstall any existing Microsoft Visual C++ Redistributable Package before installing the latest Microsoft Visual C++ 2010 Redistributable Package. From the list, find Microsoft Visual C++ Redistributable Package and click on it. Step 2: Download and install the latest package. Download and install Microsoft Visual C++ Redistributable Package (x86) from ​the Microsoft download webpage.